Home > Wheeled Sports > What is Turning Women Off Cycling? The latest results from Sport England’s Active People Survey (APS) delivered some encouraging news for cycling, with around 1.8 million adults taking part in at least one 30-minute session per week. The completed research, numbered from one to three in terms of 12-month periods – from 2005 up to and including October 2009 – did, however, record a decrease in the number of women taking to the saddle. Between October 2008 (survey two figures) and the corresponding month in 2009 (survey three), the number of men cycling increased by 118,500 while the number of women dropped, by 5,600. With a fourth survey underway, and due to be completed in October 2010, it is to the credit of British Cycling, the national governing body for the sport in the UK, that rather than wait for Sport England’s next set of figures, it has taken the initiative with a survey of its own aimed at soliciting the opinions of women as to why the gap between male and female participation is widening. The results of the survey, which ran over a four-month period, are expected to be published over the summer months, according to a spokesman for British Cycling, with a new initiative in response to them rolled out in the autumn. The interim findings have flagged up safety as a big issue for women along with a demand for more women-only ride schemes. The importance of these issues has been backed up by focus groups and other consultation initiatives by British Cycling. Worries over female participation are nothing new, unfortunately. Cycling England, an independent body established by the Department of Transport, reported similarly disappointing figures in 2008 despite the gold-medal winning performances of British women at the Beijing Olympics. Side issues from the online survey included concerns over “helmet hair”, arriving in work having perspired in the saddle, and cycling in the rain. However, it was safety which stood out as the major concern. Indeed, 53 per cent of the Cycling England respondents cited it as an issue, with 42 percent worried about their ability to negotiate road traffic. Nobody is able to guarantee safety on the road. What is within the power of each and every cyclist, male or female, is to improve their skills in order that should they find themselves on a busy road, they have more confidence in themselves and their machine to manoeuvre. These skills can be honed away from danger, on footpaths and parkways. As an example, riding in a straight line while taking one hand off the bars to signal a left or right turn - the initial wobble that new riders exhibit the first few times they attempt this are not a problem on a quiet stretch of Tarmac. But it should be ironed out before cars, buses and trucks are added to the equation. Women are well aware of the great benefit to fitness offered by cycling - witness the finding by Cycling England that 14 percent of women used an exercise bike. What is needed are more initiatives to encourage them to embrace two wheels. 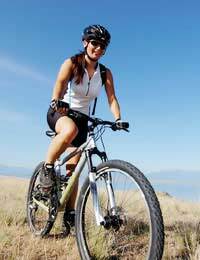 If safety remains a concern for individuals, then alternatives to the road such as mountain biking should be promoted. Women are more than capable of leaving the egos of their male counterparts a little saddle sore; it is to be hoped that the disappointing results of the most recent APS prove a turning point towards greater female participation in the sport.